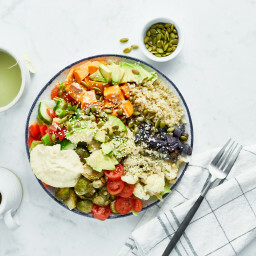 Ask Angela: Shelf-stable work lunch ideas, swapping chickpea miso, Scottsdale restaurant tips, and more! What awesome weather we’ve had in Southern Ontario this week! I finally found myself thinking yep, we made it through that long winter…we’re on the other side! Things are a-bloomin’! Lately I’ve been trying to incorporate more relaxation practices into my days as I’ve been struggling with some ongoing allergic/immune reactions and just feeling totally off balance. One thing I’ve found helpful is taking time to enjoy a morning walk before I begin my day—I used to get the kids up, feed them, and then tackle my work almost immediately, so this subtle shift in routine has been making a big difference. Connecting with nature always invigorates me. Here’s to a good month ahead! Q1. Hi Angela! I’m new to the vegan lifestyle and find the hardest part for me comes when I forget to pack my lunch for work. Do you have any suggestions for what kinds of foods I could keep at work to eat on days when I forget my lunch? Hey Kim, This is a great question! I have a few ideas. To start, I suggest keeping some nutritious, hearty crackers on hand to eat along with your favourite nut or seed butter and hemp hearts. The nut/seed butter and hemp hearts make for an easy protein- and fat-rich snack. You can also stock homemade trail mix, dried fruit, hot oatmeal packets (you can make your own as well), granola, roasted chickpeas, or soup (look for tetra packs so you won’t need a can opener). Another idea is to make a super easy balsamic chickpea salad. Simply store some small tetra packs of chickpeas (or canned chickpeas, if you have a can opener on hand), balsamic vinegar (or any vinegar you love), olive oil, salt, and pepper in the cupboard, and make sure to store a strainer and bowl at the office as well. With these ingredients at the ready, all you’ll have to do is drain and rinse the chickpeas and add them to the bowl along with the vinegar, olive oil, salt and pepper (to taste). It may not be the most glam lunch, but it’s filling and packed with protein! Q2. 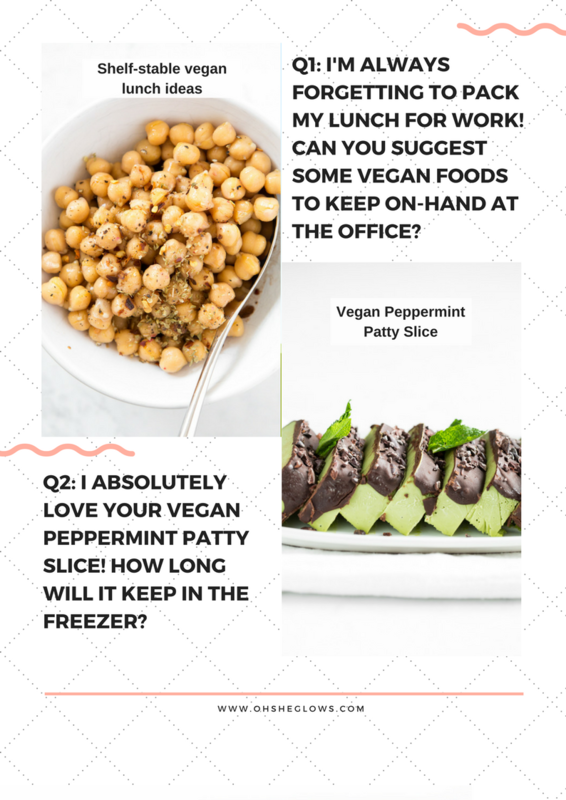 I absolutely love your Vegan Peppermint Patty recipe! I made it for my cookbook club a few weeks ago and everyone said it was their favourite of out of all 20 dishes! I do have a question, though: how long does it last in the freezer? Hey Renanit, That makes me so happy to hear! Even though I posted the recipe around the holidays last year, it’s also a fantastic dessert for the summer months since it’s served chilled. I know we’ll be enjoying it a lot this summer! The Peppermint Patty Slice should keep in the freezer for 1 to 2 months. Make sure it’s frozen solid first, and then wrap it tightly with tinfoil or other wrap. I like to place the wrapped dessert inside a freezer bag or airtight container for an extra layer of protection before freezing. Q3. I was recently introduced to your recipes and app. I’m in love! Can you recommend a replacement for the chickpea miso in your Butternut Squash Mac ‘n Cheeze? I can’t find any at my local grocery stores! Thank you, Holly! You can swap the chickpea miso for any light-tasting miso you can get your hands on. You can also make the sauce without it, if need be! The miso adds a nice depth of flavour, but the Mac ‘n Cheeze will still taste great without it. Of course, I always encourage you to tweak recipe seasonings to taste. 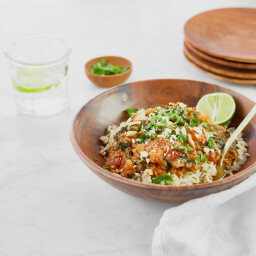 :) I think it would be fun with my 10-Spice Mix thrown in too! Q4. Hi Angela, I have been a dedicated reader of your blog for years, and I love your cookbooks and your app! We are not a vegan family but we eat a lot of plant-based meals, and you have always been a major source of inspiration for me. We have travelled to Arizona for a couple of years and I have loved using your tips about where to eat and what to do while we’re there! I wondered if you had any new finds or tips from your most recent trip? This will be our first time travelling with our son—he just turned 9 months old! (Thanks for all of the pregnancy resources and info, too! 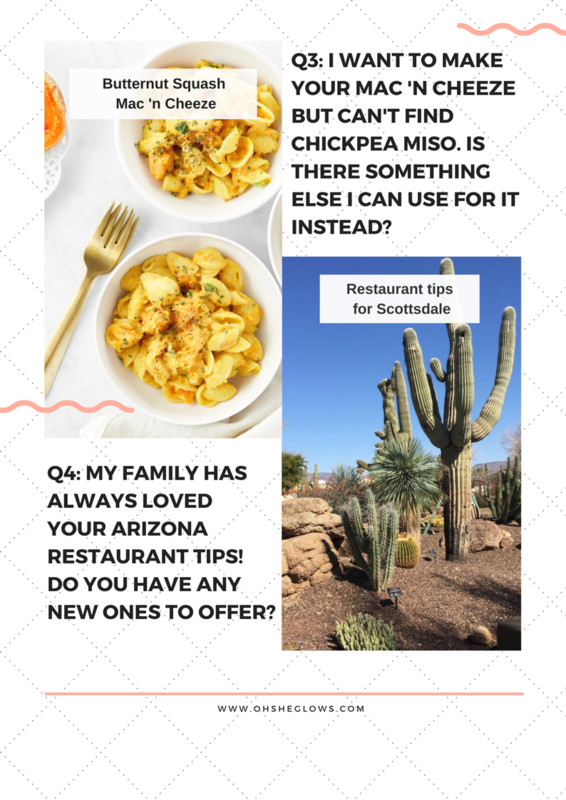 ☺) I have loved your tips for True Food Kitchen and ChocolaTree in Scottsdale, and wonder if you’ve found anything new you’d like to share? Hey Jenna, Thank you so much for all your support! I’m so happy to hear you’ve found inspiration in my recipes. :) Congrats on your baby boy! And thanks for such a great question about new AZ finds. We did find a few new kid-friendly spots in Scottsdale on our last trip. For breakfast we enjoyed First Watch a couple times…I loved the A.M. Superfoods Bowl (a decadent and super-thick chia seed pudding). Kale & Clover is super casual (you order at the counter), but still lovely. Their hummus is to die for (I could not stop eating it!) and I loved the Superfood Salad too. The Herb Box is also great (their Crisp Brussels Sprout Chips with Vegan Yellow Pepper Aioli are incredible! ), although they don’t have quite as many plant-based mains on the menu. And the patio at night is gorgeous and romantic. Of course, True Food is always a must visit, as you know. I’ve also heard great things about Flower Child, but we didn’t have a chance to go. It’s on my list for our next visit! Hi Mary-Jo, That’s such a sweet gesture to make it for your friend…I wish her all my best! 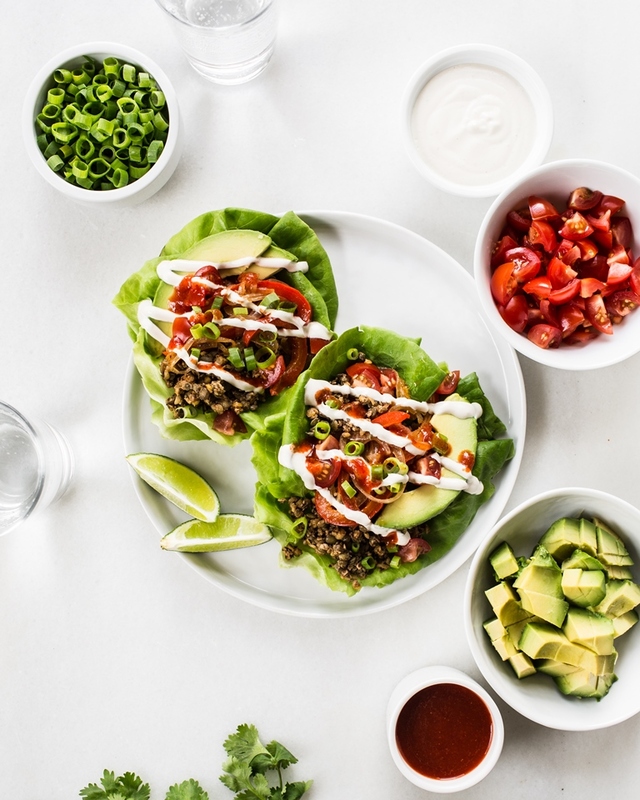 And I agree, the Lentil-Walnut Taco Meat is so versatile and perfect to have on-hand during busy weeks. You’ll have to let me know how it goes using sprouted lentils…such a fun idea, especially for summer. Hey Connie, Hmm…I’m sorry but I’m not sure! 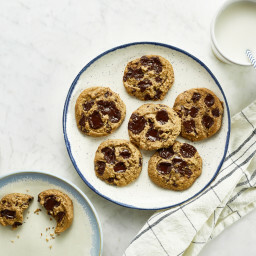 There are a couple in my recent cookbook (every day), could those be what you are thinking of? Love all your recipes. If you ever start a cooking school or just give small group cooking lessons, let me know. I just found your blog and I love it.what a great resource. Thanks so much. Thanks Lou :) So happy to hear that! Long-time fan from Winnipeg here! I’m the cook for my husband and two daughters and now that I only make vegan/vegetarian meals, our BBQ is collecting dust. Instead of the usual slap of meat on the grill, what kind of summer-appropriate entrées do you recommend? The only things I can manage to think of are veggie burgers, grilled veggies/potatoes and pizzas but I’m looking for something new and unexpected to take the cooking from inside to outside and get back that wonderful smoky flavour. Thanks so much! Hey Cheryl, Thank you so much for this idea…I’ve been thinking about BBQ-friendly foods lately too. Vegan ones are tricky to come up with, but I’ll be sure to share if I create any (or tweak any old ones to work on the bbq). 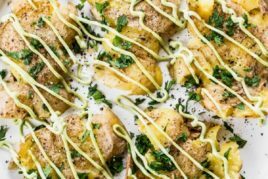 Can the All-Purpose Cheese Sauce be frozen? Hey Meredith, Yes it can, however there is a slight change in texture after thawing (it becomes slightly grainy…which I think is from the potato), but it’s not a big deal in my opinion. I hope this helps and I’d love to hear how it goes for you! Perfect timing! Our family is headed to Scottsdale for the first time soon. Good Morning Angela. We love the burger recipes in both your OSG and OSG ED cookbooks. Do you think they could be made into a loaf? Would I need to change anything? Thanks. Hey Jane, This is such a great question! I’ve wondered it myself too, but I haven’t gotten around to testing it. I can’t see why it wouldn’t work, but I’m not sure. It would likely need to be baked for 45-60 minutes (just a guess though). If you try anything please let me know how it goes. I am a “new” vegan. I started this journey 2 years ago. My 35 year old disabled daughter is on this journey with me. I have both your cookbooks but unfortunately, I have Kindle Fire so can’t access your app. The one thing I find I am really struggling with is finding vegan meals when we are sick. My daughter suffers with gastritis. Of course she has to have clear liquids, then the BRAT diet. But after that, I get lost. Leafy greens and tomatoes really bother her. Any suggestions you can offer would be greatly appreciated!! That vegan peppermint patty slice looks so great!! I live in Scottsdale and I’m vegan. There are a plethora of places! You can check out @morgarito on instagram and I am constantly updating places. We even have an all vegan champagne bar! Thanks Morgan! I heard about that vegan champagne bar…so fun. Where does one buy the containers shown on page 298 of Oh She Glows Every Day? Canadian Tire? Home Hardware? Costco? 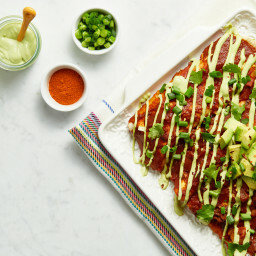 Next post: Vegan Mother’s Day Brunch Recipes!